When we first saw macros we were grossed out because the macros are a little gross looking. If you wanted to you could go to a local stream and catch some of your own all you need is a D-frame or a kick net. First you go in the water and place the net in holding the end of one side of it, then you start moving your feet side to side or front to back, then after about a minute doing that you go on the dry land and look at everything you brought. If your smart you can print of a macro-invertebrate graph that shows all the types of macro-invertebrates and bring it with you for you can know what macros you caught. And if your lucky you might just catch a small fish. Good luck on your findings. 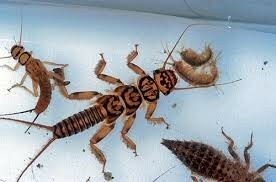 This is a good amount of macro-invertebrate. Link to pic. 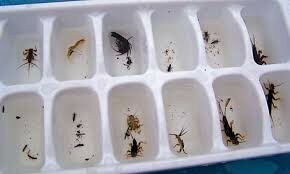 .This picture includes stone fly larva, two riffle beetle larva, riffle beetle and a mayfly larva. Link to pic.